Hyundai’s award-winning small car. Reinvented. What do you do after you’ve won Australia’s Best Cars award six times? You start again. That’s exactly what we’ve done with the Reinvented i30.Talk about Reinvention. Earn gold coins with the NEW version of Hyundai Auto Link*. The Hyundai Auto Link app has been updated and there are many new features for you to enjoy. We are excited to partner with Hyundai Help for Kids and give Hyundai Auto Link users the opportunity to earn gold coins for their nominated Hyundai Help for Kids charity partner. Furthermore, there are also prizes up for grab*! Stay connected to your i30 with the new Hyundai Auto Link app. Hyundai SmartSense™ features 8 safety technology such as Autonomous Emergency Braking (AEB),Lane Keeping Assist System (LKAS), and Forward Collision Warning (FCW). Available on Elite, Premium, SR, and SR Premium. For excellent everyday drivability there is the 120kW 2.0 GDi , if you are looking for fuel efficiency there is 100kW 1.6 turbo diesel. While for the thrill seekers there is the 150kW 1.6 turbo petrol. The new system features an all new navigation interface (now supporting split-screen display with multimedia information) with SUNA live traffic updates. This feature is available on all variants. Located in the blacked-out rear lower valance, the twin exhaust tips provide the SR range with a purposeful look. Matching the look, while the unique rear muffler produces a sweet, yet subtle burble under acceleration. Available on SR & SR Premium. All other variants feature a chrome ‘falling mesh’ grille insert, which ties in with the new cascading design. These features are available on SR Premium and Premium variants. We understand the need to stay connected, which is why the most used controls including cruise control, phone and volume controls are ergonomically positioned as steering wheel-mounted switches. Allowing you to stay connected while driving safely. The SR range features an exclusive black interior with red piping and stitching in the seats, steering wheel, front armrest and gearshift boot. Eye catching red seatbelts coupled with sports front seats give the i30 a more aggressive and sporty look. Sporty metal pedals complement the sports flair in the interior and enhance the dynamic driving experience. Apple CarPlay™ & Android Auto™ . Android Auto™ requires a device with Android 5.0 operating system or subsequent version in order to operate. The all-new i30 includes Hyundai’s latest and most advanced 8” touchscreen multimedia system. The tablet-style display panel rises vertically above the dashboard crash pad, allowing multimedia information to be displayed higher and nearer to the driver’s line-of-sight. This new system hosts a range of connectivity features (Bluetooth phone and audio streaming, AUX and USB inputs with iPod compatibility, Apple CarPlay™, and Android Auto™). The ability to tune into DAB+ digital radio stations, in addition to conventional AM/FM radio stations offers more choice of stations, clearer reception, as well as much improved sound quality. The new system now also features Sat Nav as standard across the range. It comes with SUNA live traffic updates, and an extended 10 year Sat Nav Update Plan. Compared to a conventional handbrake, the Electronic Parking Brake (EPB) not only allows more storage space in the front centre console, but is effortless in its operation. The “Auto Hold” function automatically maintains braking pressure once the vehicle has been brought to a complete stop, ensuring that the vehicle will not creep forwards or roll backwards even with the brake pedal released. The brakes are then released once the driver steps on the accelerator pedal. These features are standard on SR (DCT only), SR Premium, Elite, and Premium variants. This is standard on SR, SR Premium, Elite and Premium variants. Exclusive to the SR range, the 150kW Gamma 1.6 Turbo-GDi engine delivers sharp throttle response, impressive low-end torque, as well as surprising fuel economy. The i30 SR range offers 25% more power and 31% more torque compared to the standard 2.0 GDi engine. 7 speed Dual Clutch Tranmissions (DCT). Available with the 1.6L diesel and 1.6L petrol turbo engines, the 7-speed DCT combines the fuel efficiency of a manual transmission with the convenience of an automatic transmission. Thanks to re-calibrated transmission logic, the new DCT is now even more responsive under spirited driving, yet still offers the smooth-shifting characteristics that are desired for everyday commuting. The i30 features an Australian-specific suspension tuning, developed over thousands of kilometres of local on-road testing. The tuning programme was carried out on a variety of road surfaces, including urban roads, highways, freeways, mountain passes, as well as country roads right here in Australia. Thanks to heat treatment processes, Advanced High Strength Steel (AHSS) is up to 10% lighter than, and twice as rigid, as conventional mild steel. 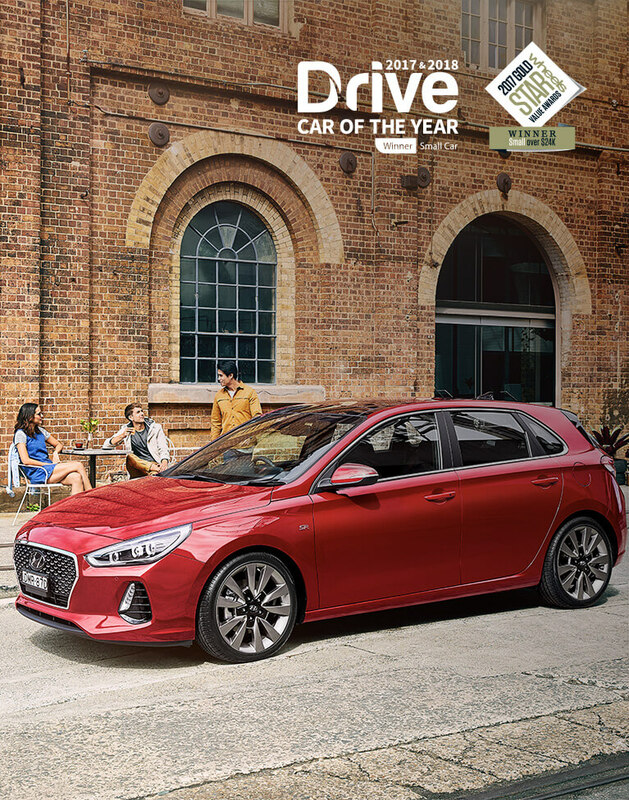 The all-new i30 features significantly increased application of AHSS, totalling 53.5% (as compared to 27.2% on the outgoing model), and resulting in a significant increase in static rigidity over the outgoing model, whilst achieving a 28kg lighter body-in-white weight. Available on all automatic and Dual Clutch Transmission (DCT) variants, the “Drive Mode” select function allows drivers to choose between ‘Normal’, ‘Eco’, and ‘Sport’ modes. The ‘Normal’ mode offers a driving experience optimised for a typical driver, whilst ‘Eco’ mode maximises fuel economy. ‘Sport’ mode offers increased steering weighting and engine response. Coupled with delayed up-shifting, this mode maximises the dynamic driving feel of the vehicle. The SR range’s Dual Clutch Transmission (DCT) variants offer steering wheel-mounted paddle shifters. This delivers a more sporty driving experience by allowing drivers to change gears via the DCT’s sequential manual mode, whilst keeping their hands on the steering wheel. Hyundai SmartSense™ features 8 safety technologies such as Autonomous Emergency Braking (AEB) and Forward Collision Warning (FCW), Blind Spot Detection (BSD) and Lane Change Assist (LCA), Driver Attention Alert (DAA), and Lane Keeping Assist System (LKAS). Available on Elite, Premium, SR (Dual Clutch Transmission only), and SR Premium. AEB works in conjunction with Forward Collision Warning (FSW) system to automatically apply the vehicle’s brakes in the case of a potential collision (where no driver intervention is detected after a FCW system warning). AEB is active above speeds of approximately 10km/h, and will attempt to bring the vehicle to a complete stop (speeds of 64 km/h pedestrians/ 80 km/h vehicles). Between speeds of 80 – 180 km/h, when activated, AEB will slow down the vehicle in order to reduce the severity of the collision. This is available on SR (Dual Clutch Transmission only), SR Premium, Elite, and Premium variants. Thanks to the increased application of Advanced High Strength Steel (AHSS) and structural adhesives, the i30 achieves improved crashworthiness through better chassis rigidity. Furthermore, the i30 features one-piece side panels, integrating the A and B pillars as well as the side sill. The use of hot-stamped 150kgf/mm2 AHSS in this panel helps maximise body rigidity for greater protection against small overlap front impacts, as well as side or rear impacts. 7 airbags including driver’s knee airbag. The new i30 features a comprehensive suite of airbags, including dual front airbags (driver & passenger airbags), front side (thorax) airbags, full-length side curtain airbags, as well as a driver’s knee airbag. FCW when active utilises the front radar sensor & windshield mounted camera to detect vehicles and pedestrians in front of the vehicle. LCA scans for vehicles approaching rapidly from the rear, and uses the same Blind Spot Detection (BSD) warning measures to alert the driver of vehicles which may be entering the i30’s blind spot at a higher rate of speed. This is available on SR, SR Premium, Elite, and Premium variants. LKAS consists of three modes – Lane Departure Warning (LDW) mode, Standard LKAS mode, and Active LKAS mode. Standard LKAS mode provides steering intervention as the vehicle is about to leave the lane, whilst Active LKAS mode provides earlier steering intervention in order to assist the vehicle in staying in the centre of the lane. When the vehicle strays from the intended lane without indicators being activated, an audible and visual warning will be sounded. ESS helps warn surrounding traffic when emergency braking on the i30 is detected. The system flashes the rear brake lights whilst braking, and automatically activates the hazard lights once the vehicle has stopped. Rear view camera & park assist system. The rear view camera not only provides the driver with a clear view of the area directly behind the vehicle, but also offers dynamic parking guidelines which swivel as the driver turns the steering wheel position. The rear view camera and 4 rear park assist sensors features are available on all variants. In addition, SR Premium & Premium variants also feature a 4-sensor front park assist system for added convenience.